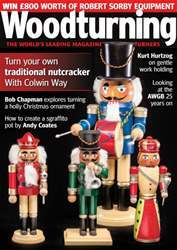 In issue 286 of Woodturning magazine we have lots for you to enjoy. In ‘Projects’ Colwin Way turns a traditional nutcracker; Walter Hall makes a pen from an aluminium bar; Bob Chapman looks at holly in his local timbers series; and Stuart King turns a miniature wassail bowl. 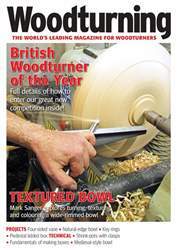 In our ‘Technical’ section Richard Findley looks at the problems associated with turning long, thin spindles; Andy Coates experiments with sgraffito on a turned pot; Kurt Hertzog shares his techniques for gentler work holding; Mark F Palma confesses to being a recovering bowl snob; Andrew Potocnik re-turns an Australian beefwood bowl; and Philip Greenwood turns two bowls to create a balancing act. 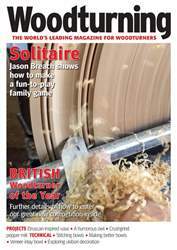 In ‘Features’, we meet Greg Teter; Eldon DeHaan explains how he turned a piece using the ‘lost wood’ process; and we look back at the history of the AWGB and find out about its future plans. As well as all this, we also have our usual ‘Kit & Tools’ pages, a giveaway, ‘Leader’ from the Editor, ‘Community news’ as well as a sneak peek of our next issue. 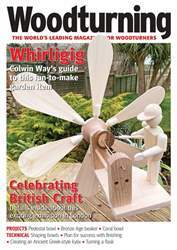 All this and more in Woodturning 286!